Styrofoam is a cheap, light-weight material that is very good at insulating. This makes it a practical option for everything from protecting objects during shipping to keeping your beverage warm. Produces toxic chemicals (from 57 chemical byproducts) that are irritants to skin, eyes, and gastrointestinal and respiratory tracts. Chronic exposure can lead to reduced kidney function, blood disorders, depression, headaches and extreme fatigue. The EPA named styrene manufacturing as the 5th largest creator of hazardous waste. There are almost no avenues for recycling Styrofoam; it’s a major component of litter and doesn’t breakdown in landfills. The campus Sustainability Master Plan has a stated goal of reducing food service waste by 90%, which includes eliminating the use of Styrofoam. The Student Senate passed a resolution to have the campus go Styrofoam free in 4 years. UNL recently passed a similar resolution and all four University campuses are currently working to reduce use and eventually become Styrofoam free. Doing so here helps this campus to fulfill our health oriented mission. I’m excited to report that the transition is already taking place. Coffee cart cups are already cardboard and the cups in the cafeteria and C-Stores are being switched from Styrofoam to cardboard. You’ll start to see that change this week and it will continue across campus. Sodexo is committed to finding other options for plates and to-go containers. As they do so, it is important to note that we aren’t just a campus. We are a healthcare institution that must adhere to infection control guidelines. We serve a lot of visitors and on-campus personnel that take food out of the cafeteria. That food needs to be safely transported at a proper temperature. We are looking for options that work for everyone. In the meantime, YOU can make choices to help. At the cafeteria, consider a plate instead of a clamshell, they have almost 65% less Styrofoam. When purchasing for your department, e-Shop now has alternatives to Styrofoam. Don’t forget reusable containers—they’re even better. Previous Previous post: Zika Apocalypse? 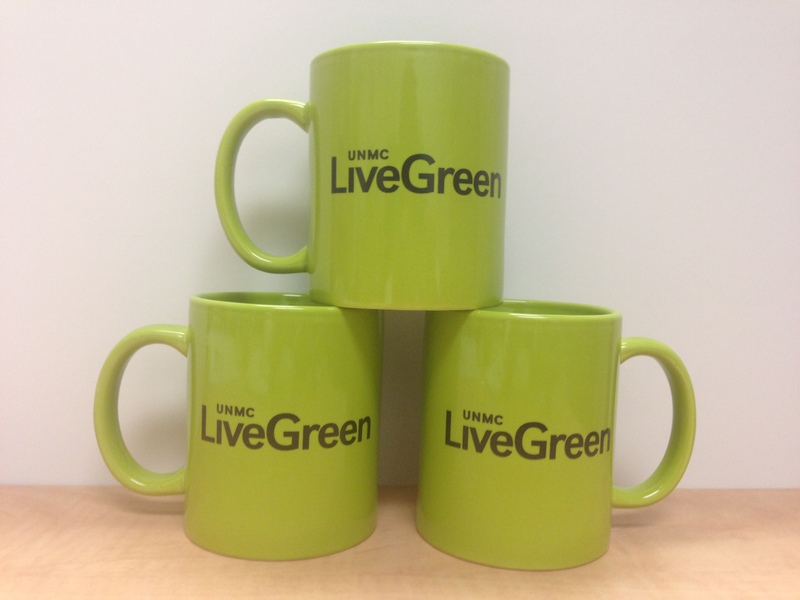 Where does one get those cool LiveGreen mugs? This is good news, Melanie! It was just a year ago that I was told I’d have to pay extra to use my own cup! We are excited too! We have to follow infection control standards so only certain cups can be used to refill, but we are finding one that will work. Coffee carts will allow you to use your own cup depending on the drink, just let them know when ordering.